Postcard of Scheveningen beach and the pier, sent in 1909. Scheveningen was originally a small fishing village just outside Den Haag (The Hague). In the late 19th century it became a popular beach resort. The pier on the postcard burned down in 1943. The current pier was built between 1959 and 1961. 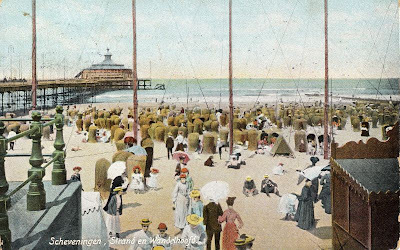 Note the nice beach chairs on this postcard, and of course the (very formal) beach fashion of the time: Scheveningen was the resort of high society (a popular Dutch singer sang in the early 1930s: Er is geen zee zo distingué, Als de Scheveningse zee, Daar baadt alleen de haute volée. There is no sea as distingué as the sea at Scheveningen, only the haute volée (high society) bathe there). I had mised this one, Hank. 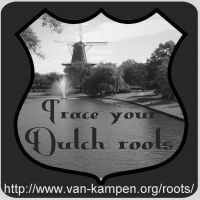 Thanks for posting the link at GenealogyWise. This scene reminds me of my childhood visits to Atlantic City Beach (NJ, USA) way back before Donald Trump and others turned it into a casino city. Of course, in the early 1960s it definitely was not a formal place.